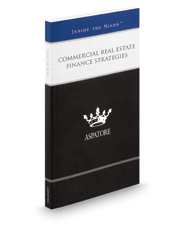 Commercial Real Estate Finance Strategies provides an authoritative, insider's perspective on helping buyers and borrowers navigate the evolving real estate marketplace. Experienced partners from law firms across the nation guide the reader through the intricacies of the commercial transaction process and address common challenges clients are likely to face. These top lawyers offer specific advice on negotiating lender deal points, selecting an appropriate broker, and determining property pricing based on location, condition, and economic situation. Addressing a range of topics from conducting due diligence to understanding client objectives, these experts discuss the need to review loans for legal weaknesses and stress the importance of learning the goals of all involved parties. The different niches represented and the breadth of perspectives presented enable readers to get inside some of the great legal minds of today, as these experienced lawyers offer up their thoughts on the keys to success within this complex legal field.